Flowmaster Performance Muffler - Super HP-2 - Dezod Motorsports Inc - Home of the automotive performance enthusiast since 2002. Flowmaster® has taken the laminar core of our classic HP-2 muffler and wrapped it in a new compact square case. The new Super HP-2 Series muffler offers the same great performance benefits and moderate tone that you would expect from our laminar flow mufflers, now in a new sleek styling. These mufflers are available in either a 409S stainless steel case or a polishable 304S stainless steel case and in sizes ranging from 2.00”, 2.25” and 2.50”. 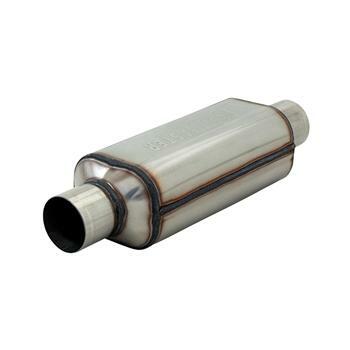 These mufflers are manufactured in the USA and are covered by Flowmaster’s Lifetime Limited Warranty.